I began backpacking at twelve, continuing until 25. After an extended hiatus, due in part to a bad back, I resumed cycling, hiking, and backpacking several years ago. I also began snowshoeing and cross-country skiing. I share my love for backpacking and these sports with my children. I am a midweight backpacker, but carry a full array of necessary gear. Among other things, the tag also states that the shirt was "Made in the USA to the highest Environmental and Labor standards." There is no pocket on the shirt. On the left sleeve, there is what appears to be a silk-screened logo. The logo, similar to that on the attached manufacturer's tag, consists of an image of a wiener dog, the manufacturer's name - TrailDog - and the words "Born on the Trail." See photo to the left. The sleeves measure 6.75 in (17 cm) in length (from the seam to the bottom of the hem). They measure nearly 9.25 in (23) across (from top to pit). Along the hem, at the sleeve opening, they measure nearly 8 in (20 cm) across. The first thing that caught my attention was the silky feel of the material. It is very soft to the touch. I was also impressed with how lightweight it is. It felt really good when I put it on. Additionally, I liked the fact that there are no seams running lengthwise down the shirt. Before putting the shirt on, I noticed a few loose threads in the seam around the bottom of the shirt. Although the hem at the bottom of the shirt is slightly uneven, the seams are straight. I do not expect the uneven hem to impair the performance of the shirt in any way. My initial testing consisted of a thorough examination of the material and seams. The material is almost silky-smooth to the touch. I noticed a few loose threads in the seam around the bottom of the shirt. I also noticed that the hem at the bottom of the shirt is slightly uneven. Before pulling the shirt on, I inspected the inside. It was then that I noticed the reinforcing and covering of the seams at the shoulders and collar at the back of the neck. I thought the extra material to reduce rubbing/chafing was a nice touch. Next, I pulled the shirt on. It fit nicely, plenty of room in the body and no binding when I raised my arms. I did notice that the sleeves are a bit shorter than my other shirts. I look forward to testing how well DRYDOG (moisture wicking), CLEANDOG (anti-microbial), and SUNDOG (UV protection) actually perform. During the Field Test Phase, I wore the shirt for thirteen days while walking trails in the backcountry and for five days while working in the yard and around home. The shirt did a good job wicking moisture away from my skin. It also dried quickly. After several consecutive days of use, the shirt did not have a funky, gross smell. Aside from the loose threads and the sleeve length, which is shorter than I prefer, the shirt has performed well to date. 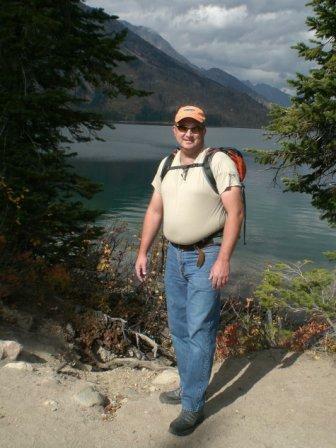 June 21 - 27, I wore the shirt for portions of seven days while serving as a Scoutmaster at the BSA Grand Teton Council�s Cedar Badge National Youth Leadership Training at the base of the Teton Mountains approximately 10 mi (16 km) east of Driggs, Idaho. The elevation is approximately 6,500 ft (1,981 m). The daytime high temperatures in Driggs ranged from 73 - 82 F (22 - 27 C). During July 8 - 11, while on a BSA High Adventure with my two oldest boys, I wore the shirt four additional days. We were in Saint Charles Canyon at approximately 6,300 ft (1,920 m) in elevation. The campground is approximately 26 mi (42 km) from the North Beach area of Bear Lake State Park located in the far southeast corner of Idaho. Straddling the Idaho / Utah border, Bear Lake is 20 mi (32 km) long and 8 mi (13 km) wide. Bear Lake is 20 mi (32 km) south of Montpelier, Idaho at an approximate elevation of 5,900 ft (1,798). Daytime high temperatures in nearby Paris, Idaho ranged from 87 - 93 F (30 - 33 C). August 8-9, at a family reunion, I wore the shirt two additional days. We were near Garden City, Utah which is close to Bear Lake at an elevation of 5,965 feet (1,818 m). Daytime high temperatures were 88 - 91 F (31 - 32 C). My first observation is related to sleeve length. The sleeves on the TrailDog shirt are 2 - 4 in (5 - 10 cm) shorter than those on other moisture wicking T-shirts I own. Consequently, the shirt feels a bit unusual in the arms when I wear it. Although it does not impact performance, I still have not gotten used to the shorter sleeves--simply a matter of personal preference. Sleeve length aside, the shirt has performed well. I really like the lightweight material; it almost feels like I am not wearing a shirt. The lightweight material enables the shirt to be compressed to a nice size so that it takes up little room. The DRYDOG (moisture wicking) wicks moisture well. I sweat rather profusely, and the shirt has done as well as any other wicking T-shirt I own. The CLEANDOG (anti-microbial) appears to work well too. After wearing the shirt for several consecutive days on two separate occasions, the shirt did not have a funky, gross smell to it. For me, the performance of the SUNDOG (UV protection) is a bit harder to judge. While wearing the shirt, I did not burn in the areas covered by the shirt. Was that because of the SUNDOG or simply because I was wearing a shirt? Not sure how to definitively tell. I will take TrailDog's word on the UV protection offered by SUNDOG. On several of the days at Cedar Badge National Youth Leadership Training and the High Adventure, I wore a daypack while wearing the shirt. The shirt shows no sign of wear or pilling. In addition, the loose threads mentioned in my Initial Report have not gotten any worse. Nevertheless, I will continue monitoring this in the Long Term phase of the test. During the Long Term Test Phase, I wore the shirt five additional days. In late September, I wore the shirt while fly fishing on the South Fork of the Snake River. In late September and Early October, I wore the shirt while doing chores around the house. In early October, I wore the shirt on a dayhike with my family to Hidden Falls, which is near Jenny Lake in Grand Teton National Park in northwestern Wyoming. The shirt has performed well during this test series. The material has held up well. The loose threads in the seams at the time I received the shirt have not gotten worse. Aside from the sleeve length, I have been quite pleased with the shirt overall; kudos to the upstart TrailDog. In late September, I wore the shirt while fly fishing on the South Fork of the Snake River near Swan Valley, Idaho. We put in just below the Palisades Dam, which is approximately 57 mi (92 km) east of Idaho Falls. The temperature ranged from the low 50's F (11 C) in the morning when we launched the drift boat to the high 80's F (30+ C) in the afternoon. There were a few clouds in the sky, and the winds were calm. In early October, I wore the shirt on a dayhike to Hidden Falls, which is near Jenny Lake in Grand Teton National Park. The park is located in northwestern Wyoming. The Jenny Lake trailhead is approximately 6,800 ft (2,073 m) above sea level. The sky was overcast and there was a slight chance of rain/thunderstorms. There was no wind and the temperature was 65 F (18 C) when we set out. It cooled off several degrees by the time we arrived back at the Visitors Center. Rain began to fall as we exited the park through the Moose entrance (south end). The TrailDog performed well on my fly fishing trip down the South Fork of the Snake River near Swan Valley, Idaho. In the morning, I wore a long-sleeved T-shirt and a fleece vest over the T-shirt. However, as it warmed up, I shed the vest and the long-sleeve shirt. I worked up a sweat casting as we drifted down the river. The shirt and its DryDog moisture wicking treatment did a much better job wicking away moisture than I did catching fish. The sun was bright and consequently, I got sunburned on my face, neck, and arms. However, where I was covered by the T-shirt, I did not get sunburned. As this is normally the case, it is difficult for me to say how well the SunDog (UV protection) worked. To test how well the CLEANDOG (anti-microbial treatment) works, I intentionally did not launder the shirt after my trip down the South Fork. I wore the shirt three additional days while mowing the lawn, working on the car, and finishing my basement. On all three days I worked up a good sweat. I did not launder the shirt after these additional three days either. In early October, my family and I hiked around Jenny Lake in Grand Teton National Park. We hiked to Hidden Falls, which is approximately a 6 mi (9.6 km) round-trip hike. I wore the TrailDog on this hike. There was no wind and the temperature was 65 F (18 C) when we set out. Even though this is classified as a moderate hike, as usual, I worked up a good sweat. Even though I was sweating a fair amount, the shirt did not become soaked. I kept asking my 19 year old daughter to feel the back of the shirt to see whether it was wet. Reluctantly, she agreed to do so. Not once did she say the shirt was soaked. This was very impressive to me. As we drove home, my family and I noticed that the shirt now indeed had a distinct smell to it. When I got home, the shirt went into the laundry. It laundered well, and the smell was gone. The shirt has performed well during this test phase. The loose seams identified in the Initial Report have not gotten any worse. I like the light weight and feel of the fabric as well as its wicking capability. Kudos to the upstart TrailDog. This concludes my test series. Thanks to TrailDog and BGT for the opportunity to test this moisture wicking T-shirt.